Acne, medically known as acne vulgaris, is a common skin problem. It can affect people of all ages, however it is more common among adolescents and young adults. Approximately 17 million people in the United States have acne at some point in their life. Acne occurs when the oil glands at the base of hair follicles become clogged. The main factors that cause acne are excessive oil production, accumulation of dead skin cells, clogged pores and bacteria. A few factors that trigger or aggravate existing acne are hormonal changes, use of certain medications, an unhealthy diet, poor hygiene and excessive stress. Acne typically appears on the face, neck, chest, back and shoulders. Signs and symptoms of acne vary depending on the severity of the condition. Some common symptoms include whiteheads, blackheads, small red bumps on the skin, pimples with pus at their tips and painful, pus-filled lumps beneath the surface of the skin. If not treated timely, acne can cause scars and dark spots on the skin. Plus, they may affect your self-esteem. 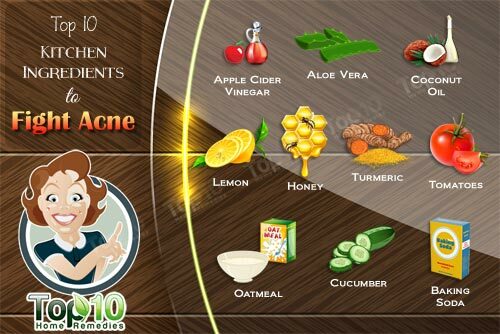 You can treat acne at home with simple and effective ingredients from your kitchen. For best results, make sure you cleanse your skin thoroughly before applying these home cures. However, if the problem becomes severe, see a dermatologist. Here are the top 10 kitchen ingredients to fight acne. Raw, organic apple cider vinegar is one of the best kitchen ingredients to treat acne. Its antibacterial and antiseptic properties help clear the pores of bacteria and oil, two main causes of acne. In addition, apple cider vinegar restores the pH balance of the skin and works as a toner and cleanser. Mix together 1 teaspoon of raw, unfiltered apple cider vinegar and 2 to 3 teaspoons of filtered or distilled water. Use a cotton ball to apply this solution on the affected skin. Leave it on for at least 10 minutes, then rinse it off with warm water. Reapply a few times a day for a few days. Also, add 1 teaspoon of raw, unfiltered apple cider vinegar to a glass of warm water and drink it once or twice daily. This tonic is very effective for those who have acne-prone skin. Baking soda, or sodium bicarbonate, is also effective in fighting acne as well as other skin breakouts. It has antiseptic and anti-inflammatory properties that help treat the cause as well as reduce the symptoms of acne. It also corrects the pH imbalance of the skin that contributes to acne. Mix 1 teaspoon of baking soda with a little water to make a paste. Use a cotton swab to apply it on the affected skin. Rinse it off after 1 minute. Lemon contains L-ascorbic acid, a natural astringent that helps dry out acne. In addition, its antibacterial properties help fight acne-producing bacteria. Using a cotton swab, apply freshly extracted lemon juice on the affected skin. Wait 10 minutes before rinsing it off with cool water. Use this remedy twice daily to reduce or eliminate acne. Alternatively, prepare a solution with equal amounts of lemon juice and rose water. Apply it on the affected skin with a cotton ball. Wait 15 to 30 minutes, then rinse it off with cool water. Repeat twice daily for as long as needed. To keep your skin free from acne, blemishes and other problems, drink a glass of lemon water once or twice daily. Note: Those who have highly sensitive skin must not use lemon remedies. A 2013 study published in the journal Chemical and Pharmaceutical Bulletin found that the compound curcumin in turmeric exhibits antimicrobial activity that inhibits P. acnes bacteria that cause acne. Plus, it has antioxidant and anti-inflammatory properties that are beneficial for reducing acne symptoms. Turmeric helps reduce acne scars, too. Mix 1 teaspoon of turmeric powder with enough water or rose water to make a paste. Apply it on the affected skin and allow it to dry. Then, rinse it off with cool water. Do this once or twice daily to fight skin breakouts. To prevent skin breakouts, prepare a face mask by mixing 1 teaspoon each of turmeric powder and raw honey with 2 teaspoons of plain yogurt. Apply this mask on your face. After 20 to 30 minutes, rinse it off with cool water. Use this face pack 2 or 3 times a week. Aloe vera gel is an effective treatment for mild to moderate acne, according to a 2014 study published in The Journal of Dermatological Treatment. It contains saponin, a compound with anti-inflammatory and antibacterial properties that help kill the bacteria causing acne, prevent infection, reduce inflammation and promote healing of damaged skin. Cut open a leaf of an aloe vera plant and remove the gel. Apply this pure gel on the affected area twice daily for a week. Another option is to blend 1 tablespoon of aloe vera gel and ½ teaspoon each of raw honey and turmeric. Apply it on the affected skin, leave it on for 15 to 20 minutes and then wash it off thoroughly with water. Do this once daily. You can also use extra-virgin coconut oil for treating acne, especially if you have sensitive skin. It contains antibacterial, antifungal, and antioxidant properties that can effectively eliminate acne-causing germs and other harmful microbes from the skin. It can even prevent free radical damage that contributes to skin aging. In addition, the oil is easily absorbed into your skin and keeps it well moisturized. Wash your skin thoroughly and pat dry with a soft cloth. Apply a small amount of extra-virgin coconut oil on the affected area before going to bed. Wash it off in the morning. Alternatively, add 2 or 3 drops of tea tree oil to 1 teaspoon of extra-virgin coconut oil. Apply this solution on the affected area, wait 10 minutes and rinse it off with lukewarm water. Use this remedy 2 or 3 times a day for a few days. To prevent acne breakouts and keep your skin healthy, take 1 tablespoon of extra-virgin coconut oil orally twice daily. 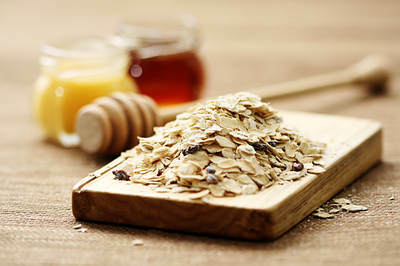 Oatmeal cleanses skin pores and absorbs excess oil, which helps treat acne. In addition, it exfoliates your skin to get rid of dead skin cells that contribute to acne as well as reduce acne scars. Mix 1 tablespoon of oatmeal with enough milk to form a paste. Wash your face with warm water to open your pores, then massage this oatmeal mixture on the affected areas in a circular motion. Wait 5 minutes before rinsing it off with warm water. Alternatively, cook ½ cup of plain oatmeal in water. Mix in 1 tablespoon of honey. Apply it on your skin and allow it to sit for 10 to 20 minutes. Rinse it off with lukewarm water. Use either of these remedies once or twice a week to prevent and treat skin breakouts. 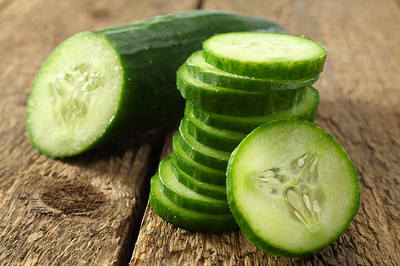 Cucumber is also beneficial for acne-prone skin due to its cooling and soothing properties. It has an astringent effect that helps reduce the inflammation of acne and promotes healing. It also helps maintain the skin’s pH balance. Extract cucumber juice and put it in the refrigerator for 20 minutes. Apply the chilled juice on the affected skin using a cotton ball. Wait 15 to 20 minutes before rinsing it off with cool water. Repeat 2 or 3 times a day for a few days. To prevent acne breakouts, drink cucumber juice or eat fresh cucumber daily. 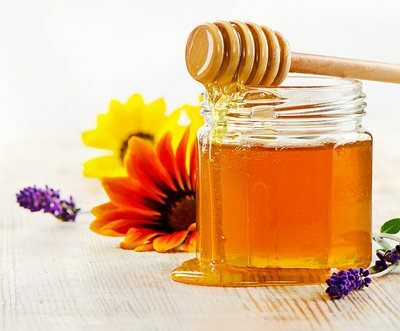 Due to its antibiotic properties, honey is another effective remedy to fight acne. It helps kill the bacteria that cause acne and its anti-inflammatory properties help reduce the redness and inflammation associated with it. In addition, its antioxidant property helps prevent damage caused by free radicals. Apply a small amount of manuka honey on the affected area. Allow it to sit to 15 to 20 minutes. Rinse it off with warm water first, then with cold water. Follow this remedy twice daily for about a week. Alternatively, prepare a mixture with equal amounts of raw honey and powdered nutmeg. Apply it on the affected area, leave it on for 20 to 30 minutes and then rinse it off with water. Use it once daily for a few days. To prevent acne breakouts, make a face pack with 2 tablespoons of honey and 1 teaspoon of cinnamon powder. Apply it on your face, wait about 10 minutes and then rinse it off with warm water. Use this face pack once a week. 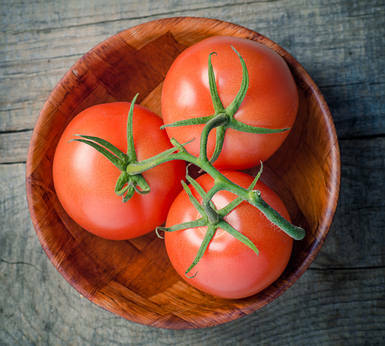 Due to their astringent and antioxidant properties, tomatoes also help treat acne and other skin breakouts. They help reduce the production of serum, one of the causes of acne. Being rich in vitamin A, they can also stop skin damage on the cellular level. Simply rub a slice of tomato on the affected skin for a few minutes, then rinse it off with warm water. Repeat twice daily for a few days to treat mild acne. For severe acne, mix 1 tablespoon of tomato juice, a few drops of lemon juice and ½ teaspoon of raw honey. Apply the mixture on the affected area with a cotton ball. Wait 5 minutes, then rinse it off with warm water. Use this remedy once daily for a few days. Wash your face twice a day with a gentle cleanser. Do not scrub your skin, as it can make acne worse. Do not pick, pop or squeeze your acne, as it may delay the healing process. Keep your hands off your face. Stay out of the sun and avoid tanning beds. Do not use too much makeup and never go to bed without removing your makeup. Take a shower after strenuous activities. Keep your skin hydrated by drinking plenty of water throughout the day. Increase your vitamin A and zinc intake to improve the condition of your skin and prevent breakouts.